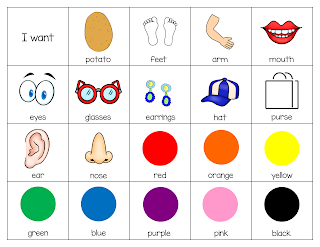 I love finding fun ways to get my students with ASD to communicate, comment, and request. Mr. Potato Head is a great activity that lends itself to lots of requesting for multiple items. Plus, it works on body parts too. 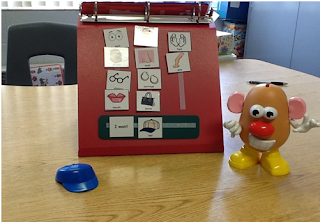 I used a huge board that I purchased from Pyramid Educational Consultants as a place for all of my icons and a sentence strip. Students placed their icons on the sentence strip and requested each piece. I made it simple and only had one choice for each piece (i.e., one nose, one mouth, etc.). If you want to add attributes to request, you can use color icons also. Students then ask for the "red nose" or the "yellow feet" instead of just "feet." Have fun creating silly potato friends! ***Updated 4/23/2013: I just found a fun Mr. Potato Head app that is Free! There are in app purchases available, but you can use the free version and have a lot of fun with it! You can find it HERE. I love this, although I teach middle school. Not sure yet whether Mr. 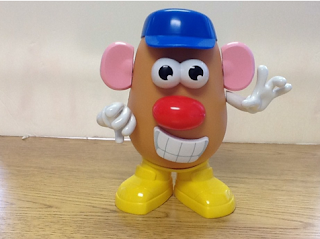 Potato heads are too young for my students. But I like them, so maybe not. I am your newest follower. I found you via Autism Classroom News. I also have recently started a blog, but it's still a work in progress. Looking forward to getting your emails! Thank you for being my newest follower! I look forward to checking out your blog too!